I was simply writing about Ripley's Petrified Man that was on display at their Orlando, Florida location, up until about two years ago. I was recently at the Orlando museum and was surprised and disappointed to see that he had been replaced with a set of miniature Japanese ceramic warriors. I asked the fellow at the register, who informed me that it had been removed from display after complaints of indecency by visitors. I then asked him why they didn't simply place a loin cloth over him. He just shrugged his shoulders and laughed. I then wrote directly to Edward Meyer at Ripley's, who informed me that the Petrified Man is actually owned by a man in Jacksonville, Florida, who leases it out to the Orlando Ripley's franchise owner, who just so happens to be the same fellow who opened the "House of Katmandu" attraction in Spain. The very same one that I had created several attractions for. He had the piece actually transferred over there two years ago. The specimen's actual owner, that is currently leasing it, had started exhibiting it himself sometime back in the 1940's. ** "Solid Muldoon" However, photographic comparison determined otherwise, besides the fact that I recently discovered that the original has been buried and is marked with a headstone. While researching this matter further on the Internet, I stumbled across the attached advertising drawing for "Chadron's Petrified Man". It is in the exact same position as the Ripley's Petrified Man, and I believe them to be one and the same. So, apparently it had already been on display long before at some point in its past history. I have also attached a picture of Ripley's for comparison. I was not sure if you were aware of this information or not, however I thought that I should bring it to your attention, as it might help unravel the mystery and some of the lost history of this bizarre and fascinating relic. If you have any information at all on this particular petrified man, and/or its exhibition and history, it would be most greatly appreciated. **The original Solid Muldoon was the name given to a mysterious "prehistoric human body" dug up near Beulah, Colorado, in 1877. The seven-and-a-half foot stone man was thought to be the "missing link" between apes and humans. "There can be no question about the genuineness of this piece of statuary" said the Denver Daily Times. 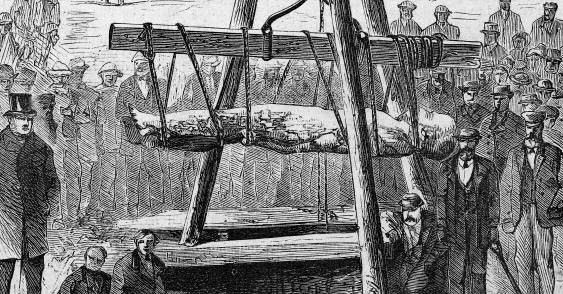 It was later revealed that George Hull, perpetrator of a previous hoax featuring the Cardiff Giant, had spent three years fashioning his second "petrified man", using mortar, rock dust, clay, plaster, ground bones, blood and meat. He kiln-fired the figure for many days and then buried it. A few months later, as the celebration of Colorado's year-old statehood approached, the statue was "discovered" by William Conant, who had once worked for the legendary showman P.T. Barnum. News of the find quickly spread to Pueblo, Denver, and eventually to New York. The statue was named the Solid Muldoon after William Muldoon, a famous wrestler and strongman who had been honored in a popular song. Displayed in New York, it attracted large crowds until an unpaid business associate of Hull revealed the hoax to the New York Tribune, and the statue was seen no more. In 1983 John G. Maher concocted a hoax inspired by fossil discoveries. Maher commissioned a detailed concrete cast of a man then buried it north of Chadron. It was "Discovered" by a Smithsonian Institution scientist, who labeled it a petrified man about one million years old. Before long the petrified man was being exhibited at fairs and other events throughout the country, until Maher himself exposed the hoax. The figure was "laid to rest" in Illinois. The Iowa Giant - Gypsum, along with many rocks and minerals found in Iowa, has significance beyond the walls in your home. Iowa played a role in one of the greatest hoaxes ever portrayed on the public of the United States. I am talking about a man who stood 10 feet 4 and � inches tall, and weighed nearly 3,000 pounds. This man traveled extensively, leaving Iowa and moving on to Chicago, IL and then further east to New York. Some may have already guessed of whom I speak, others are probably oblivious to the name. The man I speak of is known as the Cardiff Giant. I use the term man loosely, as some of you are aware, because the man was not a man at all.